UK - For an unprecedented third time, London based projection artist Ross Ashton’s ground-breaking "Crown of Light" work was invited back to Durham Cathedral for the 2013 Durham Lumière Festival, a four-day event, curated and produced by Artichoke, commissioned by Durham City Council. Says Ashton: "It’s a fantastic honour to be asked back to one of the most beautiful cities in Europe with the same show, and a real testament to the popularity of the piece in 2009 and 2011. We offered all those who enjoyed it before the chance to repeat the experience … as well as attracting a new and equally as enthusiastic audience." "Crown of Light" covered the entire North façade of the Cathedral including all sides of the three towers, and was the festival’s largest installation. The story captured the history of the Cathedral including the Lindisfarne Gospels, noted for their amazing accompanying imagery and spectacular Celtic calligraphy. These were originated by the Lindisfarne Monks and stored in Durham Cathedral for many years, along with the bones of St Cuthbert which still reside there. Ashton's show also explored the building as an architectural space and its relationship with and historical significance to the City. Ashton evolved the PIGI projection images in collaboration with musical director Robert Ziegler and sound designer John Del Nero, who compiled a soundscape for the 16 minute show. Ashton sourced images from the British Library and also conducted a photo shoot at the Cathedral to record all the architectural and structural elements he wanted to incorporate into the show. 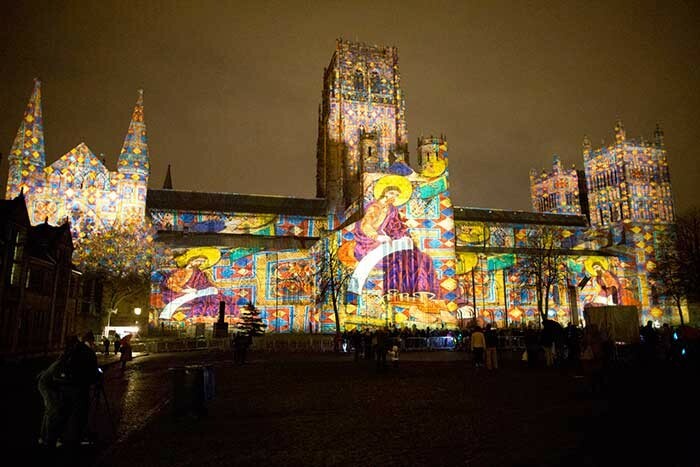 The projection system comprised seven PIGI 6kW machines with double rotating scrollers, positioned at various distances around the Cathedral - the longest throw distance was 150 metres and the shortest just 20 metres. This was carefully calculated to eliminate any shadowing from the plethora of trees dotted around the Cathedral Gardens - and was also a primary creative and technical challenge of the project. The seven projectors – supplied by White Light - were in six different locations, fitted with five different types of lens, ranging from a 10cm wide angle lens to an 85 cm long throw lens. Images from each individual machine enveloped a separate zone of the Cathedral's architecture in colorful, bold, detailed imagery. The PIGI film scrolls were each about 15 metres in length, for which the PIGI artwork assembled and pre-corrected for perspective and keystoning in Photoshop. The show was programmed into E/T/C's PC-based OnlyCue controller and operated by Karen Monid. It featured some fabulously smooth movement dissolves, transitions and other subtleties for which this control system is renowned especially in the hands of Monid, an expert in its optimization! Projection Studio’s Steve Larkins dealt with all the project logistics, working with Erwin de Gans and Michael Barry who tech’d the projectors, which were all housed in custom weatherized hides for the duration. This year there was an extra relevance in that the Lindisfarne Gospels, right at the heart of the ‘Crown of Light’ narrative, were returned to Durham on three months loan from the British Library for a special exhibition. They were removed from Durham Cathedral some time in the 16th century during Henry VIII’s Dissolution of the Monasteries. Durham Cathedral dates back to 1093 and is regarded as one of the finest examples of Norman architecture in the country. It is a designated UNESCO World Heritage Site along with nearby Durham Castle which faces it across Palace Green. 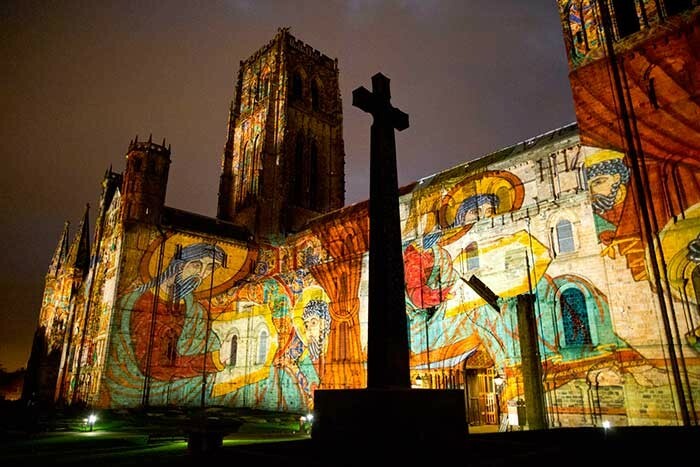 ‘Crown of Light’ ran twenty times each night and proved another massive success, together with fantastic weather, helping to draw over 200,000 people into Durham across the four days –33% up from the 2011 event - to enjoy this and the other works.